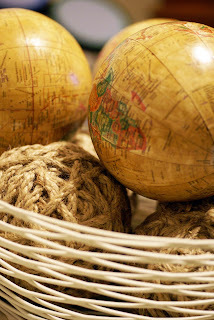 We like to decorate with maps and globes. These are from Target with accessories from Joanns. love the maps in circular. i did my all white laundry room with maps as my wall paper with places i have lived, places i have visited and places i want to go. it makes the room you have to be in, cozy and dreamy. very cute yellow and grey bag, i think it will be a hit. We love maps too, and have some maps on our sitting room walls. I love the globes!